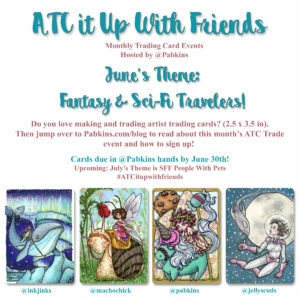 #ATCitupWithFriends ATC Monthly Trade Events hosted by Pabkins. Fantasy / Sci-Fi Travelers & Adventure! For this months theme I really want to challenge you to create a little scene if you can. Portrait style cards are still ok but I think a bit of challenge is good for the artistic soul and I’m putting this theme out early so you have plenty of time! Break outside the box and get creative. As the theme is TRAVELERS & ADVENTURE so your card should either feature a traveler or how to travel, or a setting that indicates adventure . And what is the best thing about Traveling anyways!? Adventure of course! So have fun on yours! or perhaps the mount lost its rider and you see it with an empty seat or saddle, or its a ship, flying boat, floating island, robot suit, something anything where you know someone could be inside or on it. Something to indicate they are on an adventure, are traveling, questing or going someplace. You know that feeling when you are reading a book and you turn the page to see an illustration and you know that this book or character is going someplace. Please think about background, accent, composition and Be creative and make some gorgeous cards! Many folks participate monthly. You want your cards to be unique so that if someone receives another of your cards that don’t feel like they are getting the same thing each month. Please be creative and DO NOT SEND practically identical face shot cards. This makes it very difficult for me to swap cards if you send the same composition of face cards each month. Click here to see a PINTEREST Board for some inspirational pleasure! PLEASE FOLLOW THE ADVISED SHIPPING TIME! – if your cards don’t arrive by the due date I cannot guarantee they will make it into the group. CANADIAN ARTISTS – Your envelop SHOULD BE MAILED AND POSTMARKED on or before June 20th. Mail from Canada to US usually takes 4-10 days. – SENDING EARLY IS FINE! SENDING LATE IS NOT! It is upon my discretion to return late cards back to the artist’s unswapped. – CREATE 3 ORIGINAL Hand drawn or hand painted artist trading cards from the above theme. No Political or Religious cards permitted. Or I will need to return them unswapped. – Optional: – “Host Gift Card” for Pabkins! It’s just an extra 4th card in the same theme if you have time. Everyone that knows me knows I’m a CRAZY ATC addict. Running this group takes a lot of my time and effort and I make a LOT of extra cards for it each month so I don’t get to do as many personal trades elsewhere. So if you want to put a big smile on my ATC loving face send 4 cards instead of 3 and I’ll get to keep one – Yippeee! I literally do a happy dance when I get one! – Optional: – DONATIONS! – Hosting these monthly swaps costs money and I now no longer have a job so would appreciate any help you can give. Even if it’s just a stamp or a $1! If you could spare any of the following to help ease my workload I’d appreciate it! a pack of Kraft 5×7 envelopes with notecards or a few quarters of dollars towards the ones I buy in bulk. The monthly group is now 50-65+ artists every month and those envelopes add up! Or slip a $1 in with your cards towards me buying a pack. Any Extra ATC any theme or even any you have laying around in need of a new home. Every month several envelopes go missing and I try to ensure no one goes with an empty mailbox. You can help me make that happen! Sticker or prints 5×7 or SMALLER! – All Cards must be RECEIVED by Pabkins on or before the DUE DATE! I try to give a short 5 day grace period if you’ve mailed out in a timely manner and notified me asap. It is up to my discretion to turn away artists that are constantly late in sending their cards, or if they rushed the quality. It isn’t fair to swap out your 1 hour rushed cards for ones others spent a fair amount of time on. Please don’t make me the bad guy. – ORIGINALS only! No prints, Do not copy someone else’s art, no tracings, no stolen art, Create your own original work of art! Hand drawn or painted cards only! Don’t make 3 practically identical cards, that does not show creativity or effort! Please don’t send the exact same face shot and composition cards every month, break outside the box and try something new. No religious or political content in your cards. It is up to my discretion to return cards unswapped! Examples of when this might happen are if they: 1) arrive too late to go into the swap (or you’ve consistently been late each month) 2) show lack of honest effort or there are no comparable effort cards to swap them with, 3) they do not meet the theme or size requirement, rough edges, poorly cut or 4) are damaged. I am NOT responsible for lost cards that do not arrive to me or that do not make it back to you. I try to replace lost cards to the best of my ability as I never want anyone to go with an empty mailbox but this is not always possible and whether I have any donation cards. – SHARE ON SOCIAL MEDIA! 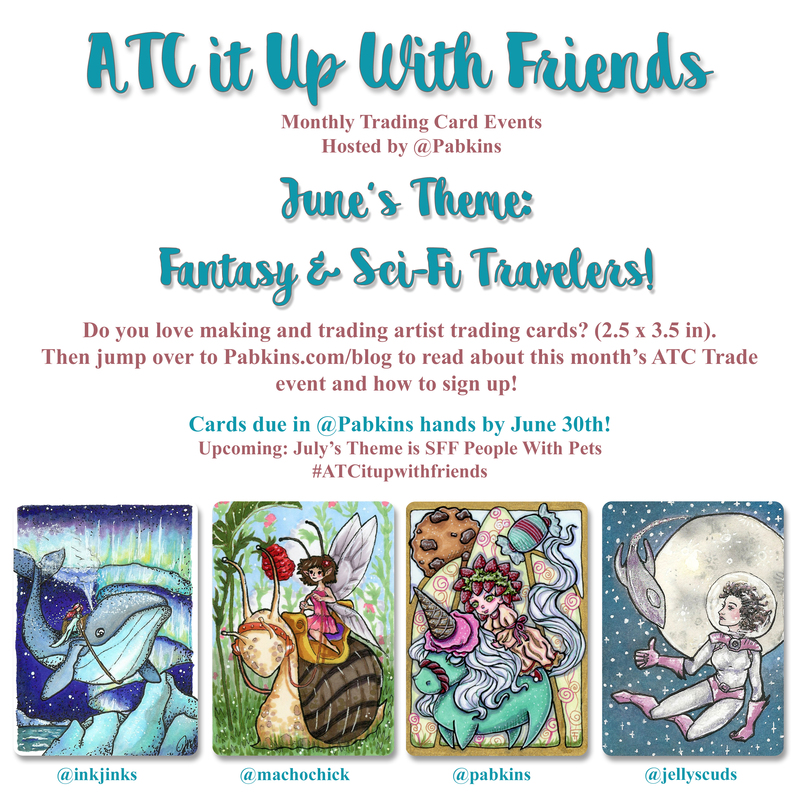 – This is optional but encouraged – it helps our litle ATC trade event grow and builds a sense of community. So post your WIP cards! Post your finished cards! you can even post the cards you receive in return! 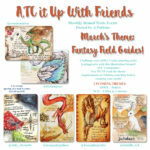 on instagram and hashtag #ATCitupwithfriends. Get all those other traders fired up for what they might receive – and hey go take a look at the hashtag and comment on the ones you like. I am always looking at the hashtagged posts! – INDIVIDUALLY sleeve each card – document protectors, penny sleeves (see this link), or ziplock bag – just protect it as envelopes often get wet! LOST MAIL, LOST CARDS – I am not responsible for lost or stolen mail. If I do not receive cards I cannot swap out cards from the group swap. I try to make sure no one goes with an empty mailbox but I cannot do this alone as the group is too large. Donation cards for lost or stolen envelopes are appreciated. If I attempt to replace a lost envelope it will be solely upon my discretion and likely only if you are standing member of the group and if you agree to donate some future emergency cards. INCLUDE YOUR POSTAGE AND RETURN ADDRESS LABELS PLEASE!!!! If you can a self addressed stamped envelope would be great! – INTERNATIONAL ARTISTS: please donate $1.15 via the Paypal friends and family method to pabkins @ gmail as an international postage stamp costs $1.15. – INCLUDE a LARGE and CLEARLY WRITTEN RETURN ADDRESS paper or sticky label with your cards!!!! (sticky label preferred – come on make it easy on me! but a piece of paper with your address clearly written on it is fine also and I’ll tape it to the envelope. – I SUPPLY: the return envelopes, sleeves and postage overages, Random prints, stickers, and sometimes extra originals. DONATIONS ARE WELCOME!